We pride ourselves on only using quality glass products and exceptional workmanship..
Shower walls - We can go over existing tiles with panels of coloured glass within your shower recess area and add a sleek 10mm frameless to Modernize your existing bathroom. Mirrorstarr is toughened Mirror which can be used in heat effected areas. This product is not as bright silver as a standard silver mirror but throws a slight smokey grey finish. No Kitchen is to big or small, no colour is not achievable to colour match. Our specialized team member comes and does a accurate site measure on the area required for glass. 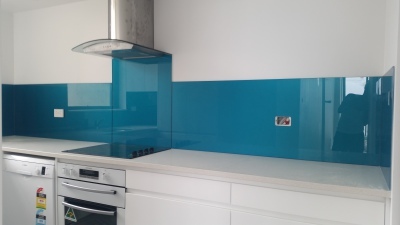 The maximum size of a panel of coloured glass is 3.6mm that can be installed without having joins.